How much do green roofs cost? Green Roofs - Are they worth it? Green roofs are pretty simple constructions that can be fitted to most buildings with a suitably flat top. They work best when there is less than 20-30 degrees of slope to contend with and all consist of the same basic elements: A waterproofing membrane, a layer of soil, with the vegetation of choice on top. Extensive roofs will have a thinner layer of soil and are suitable for shallow rooted plants such as mosses and sedum that are fairly easy to maintain. An intensive roof garden has deeper soil and so can cope with hardier flora, even trees with stronger roots. The first thing you will need to consider is whether your green roof can take the weight of a full grown garden on top. Your installer will have to take into account not only the dry weight of your garden but also how much it will weigh once that first downpour comes. Most roofs should be able to take this additional burden but a full survey might ease worries if you think you could be heading for a nasty accident. It may that your roof will need some additional support before it is safe to proceed. Assuming that your roof is suitable for a garden there are a number of layers that make up both extensive and intensive varieties. The only difference between the two is just the thickness of the soil layer. If your roof is flat, the installer may well first fit a protection board that covers your normal roof. Over this a waterproof membrane will be laid. This is normally made from a material such as ethylene propylene diene monomer which is a rubbery material similar to the lining put down when you build something like a duck pond in the garden. The purpose of this layer is to prevent water getting in but also stops roots from the plants growing down into the roof. You can opt to put in an extra insulation layer that can be placed either on the roof beams or above the waterproof layer. Also performing the task of stopping the roots growing down are a filter layer, a drainage layer and a water retention layer. All these also help to keep the water spread evenly across the garden and also prevent the soil medium from being washed away. On top of all that is the growing layer which is usually made up of a mix of porous material and soil. The aim is to find a growing medium that is as light weight as possible but that allows the plants to grow and thrive. Finally, there are the plants. 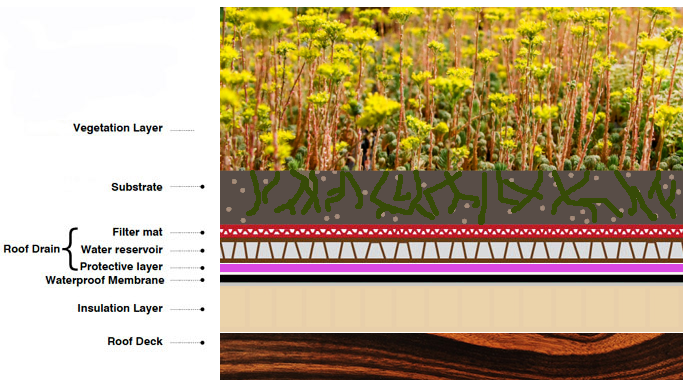 For a shallow, extensive green roofs then you are probably looking at plants like sedums and delosperma plant varieties that will enjoy slightly drier conditions. For intensive and deeper green roofs, you can have more variety because of the depth of soil, and choices could include grasses and shrubs. As with any garden, you will need to maintain your green roof. Extensive green roofs are lower maintenance than intensive but they all need the usual weeding and occasional cutting, which is why you should be sure that you have safe and easy access to the site. The extra work with intensive green roofs is in maintaining the soil layer and making sure that it is not eroded away. Find out more about maintaining green roofs. One area where green roofing has taken a step forward in recent years is the rise of bio-diverse or brown roofs that are specifically designed to encourage wildlife such as rare birds and insects. They work in a similar way to green roofs but will have individual characteristics that attract certain fauna and might include sand, stones and specific plants (for instance to attract butterflies). It’s not just your roof that can be turned into a garden. With the use of panels on your walls, both inside and out, these too can be turned into a great habitat for plants and animals. The challenges are slightly different but the principals are the same and they can make your house or office building look stunning. Discover more about green walls here. There is plenty of scope for imagination when it comes to installing green roofs. You can plant a wide range of flora and you can cover part or whole of a roof. Generally, you don’t need to apply for planning permission if you want to turn your garage roof into a garden or make your side wall into a Babylonian treat, though it pays to just check with your council first. Green roofs give you the opportunity to push back the concrete jungle and make something that is both eco-friendly and good for you heating bills by providing extra insulation. They are also pleasing to the eye and can raise the green credentials of your neighbourhood by providing a new home for all sorts of wildlife. Find out more about the cost of green roofs.